Home / Social Media / Trending / Couple Took A Sweet Selfie But After Looking Closer To The Image You Will See Something Terrifying! 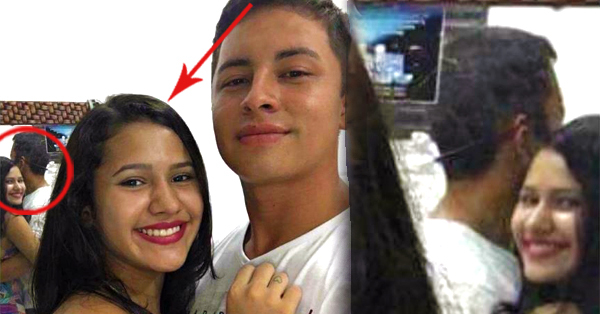 Couple Took A Sweet Selfie But After Looking Closer To The Image You Will See Something Terrifying! If you search the internet, you would be able to find lots of photos with strange things in them. By strange, we mean ghost photobombers. Because we live in the digital age, it’s hard to tell whether these pictures are authentic or just edited for the sake of getting views. These photos usually have stories behind them that are creepier than the picture itself. One guy uploaded a picture online of him and his girlfriend but something seemed a bit odd with the photo. However, if you look closer, you’ll see something weird in the mirror behind them. It turns out that the girl’s reflection is showing her smiling instead of reflecting the back of her head. The creepy photo, which was uploaded on Twitter, immediately went viral. Most Twitter users were immediately freaked out by the photo. One Twitter user luckily pointed out the secret behind this photo. It was revealed that the photo is just edited and is meant to show that the guy loves his girlfriend despite being two-faced, a characteristic distinct to Geminis. Do you believe that the photo is edited? Tell us what you think in the comments section below.